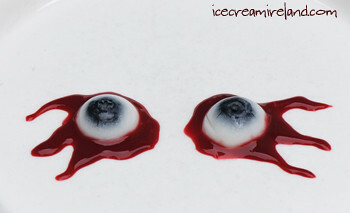 This year, for Halloween, I made these awful looking eyeballs for our shops. They are not hard to do, and they are quite tasty! If you wish to make them, you will need chocolate moulds, round ice trays, small glass dishes, or anything else you can use to get the half-sphere shape. If you like the bloody-looking raspberry puree, the recipe is here. 1. Combine the water, yogurt, sugar, and agar agar flakes and let stand for five minutes. 2. Blend with blender or mixing rod. 3. Transfer to a saucepan and bring to a boil over medium heat. 4. Turn down the heat and simmer for three minutes. 5. Add the lemon juice and blend again. 6. 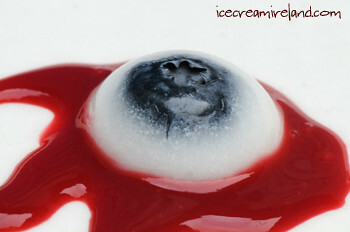 Carefully pour over a blueberry, which you have placed in a mould, using only enough liquid to cover the blueberry. 7. Let stand for about 15 minutes, until the agar agar has started to gel. 8. Push down the blueberry to make sure it’s at the bottom. 9. Allow to set completely. 10. Carefully remove from mould. You might need to slide a knife around the edges to get them out. 11. Decorate with raspberry puree (optional).